Mariana Lebrón is an assistant professor in the College of Business and Economics’ management department. In 2002, she was one of 7,500 selected from 210,000 nominees to carry the torch for the Olympic Games. Her research explores the leadership influence of power and diversity (e.g., gender, race/ethnicity, sexual orientation) on performance. She has spoken at numerous companies, organizations and conferences about how power influences leaders and how leaders develop top performing teams and inclusive educational learning environments. 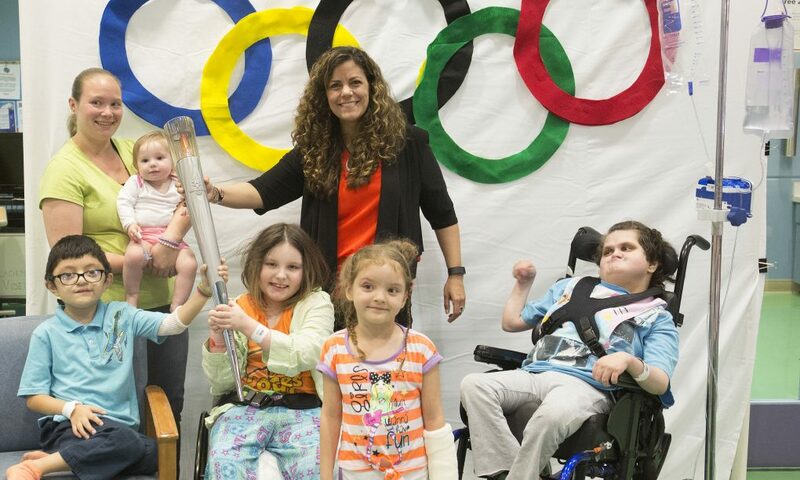 When I was nominated to carry the torch for the 2002 Olympic Games Inspirational Torch Relay, I quickly learned being a torchbearer means more than just carrying the flame. Olympic torchbearers come from all walks of life. And while the torch symbolizes many things to the world watching the games, the torch represents something different to each person who carries it. As I hoisted the three-pound torch with the two-foot-high flame along my leg of the relay, I tried to run close to the cheering kids along the route to share the flame with them. “The Olympic flame, the Olympic flame, this is your flame!” I yelled to them. For me, the torch inscribed “Light the Fire Within” and its flame represent the spirit of being true to yourself. And it’s our choice to carry that torch; no one else can decide. The power we receive from embracing our true selves—from carrying that torch—can be life-changing. 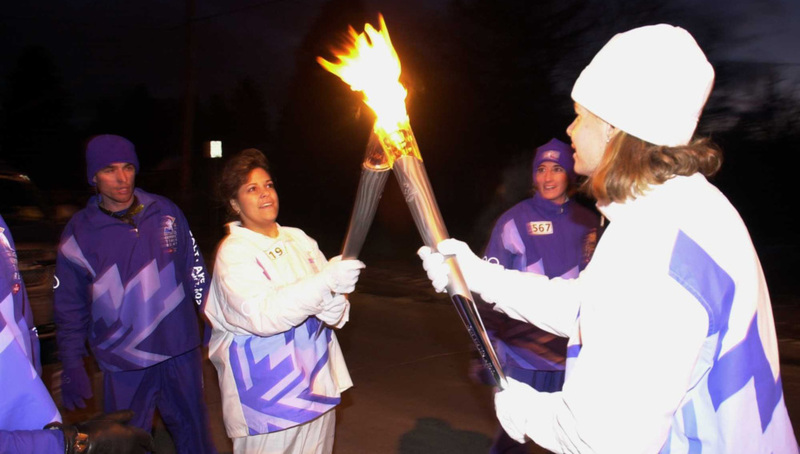 Assistant Professor of Management Mariana Lebron was one of the few selected to carry the torch during the 2002 Winter Olympic Games Relay. Over the years, I’ve learned that torchbearers of this kind exist among us but they often don’t realize it. I’ve spoken with thousands of people, from a 2-year-old to the energetic age of 93, who wanted to realize their dreams but struggled with fear, not knowing the inner strength they possess. When people take the torch in their hands, they feel at least a tiny surge of power. You see it in their body language, hear it in their voice and feel it in their presence. This experience was no different when I visited children at Mt. Washington Pediatric Hospital in Baltimore and the Hematology/Oncology Unit at Inova Children’s Hospital in Fairfax, Virginia. I met so many children who taught me (and can teach all of us) how truly powerful we all are. With gratitude, I honor these young torchbearers by sharing the “Power Secrets” one brave torchbearer taught me. Power Secret No. 1: Though you may not feel worthy, you do have power. When I shook Tommy’s* hand, I was less surprised by the tubes connected to his young body and more by the intense heat in his handshake. “So, I have an Olympic torch here. Would you like to carry it?” I asked. I struggled to respond. How can an 11-year old boy battling non-Hodgkin’s lymphoma think he was not worthy to carry this three-pound torch? “Really?” Tommy asked. Nodding, I described stories of torchbearers I met that cold December night along the Torch Relay route. I told him about Julie, who for three months drove hours each morning and evening to help ill family members, and Alejandro, a now-retired veteran, who survived a gunshot wound in the head while serving overseas. I asked Tommy again if he wanted to hold the torch. Tommy nodded and opened his arms to receive it. Power Secret No. 2: There is power in your voice. With conviction in his voice, he shared his hopes and dreams, describing his talents with numbers, and how he learned all he could sitting in bed, watching TV and reading. ”Then you should tell them,” I said, smiling. “What?” he said, looking confused. Real torchbearers, the ones who really make our world better, never think they are worthy. He wasn’t sure what stopped him. Torchbearers are never certain their ideas will work, but power lies in honoring your own voice and story. I shared with him how people told me I would never graduate, let alone be the first Hispanic American graduating from my university’s business school and the 39th Latina management professor in the country. I told him about others I’ve met who were told, “You’re not smart” or “You’re not capable” and yet were able to achieve what others said was impossible because they believed in themselves. Power Secret No. 3: Believe the impossible is possible, no matter what anyone else says. Tommy’s parents and I stood by his bed smiling, inspired by this young man. In his hands he gripped the Olympic torch tight, but in a way he’s always held one inside by being true to himself. Later on during my hospital visit, Tommy’s mom found me. For a long time, she and his caretakers had been encouraging him to participate in “Make a Wish,” but that day was the first time he actually expressed interest in doing it. What was one of his wish ideas? To meet with policy makers to talk about curing cancer. This brave boy realized his worthiness, found his voice and continued to have hope, believing the impossible is possible. The torch may have helped, but I know the true power comes from within him. And so I continue passing the torch to “Light the Fire within” others on the #SassyDreamingTour—honoring the torchbearers among us. Categories: Profiles, Spring 2017 Tags: spring 2017 Author: Lebron, Mariana J.